We’ve covered Diwali, Hanukkah, and Christmas in our holiday food and story features. Now, it’s time to go way back to a celebration that may seem familiar in some ways, though it is often forgotten as a niche practice in the shadow of the flashier, more popular holidays. I’m talking about the Pagan celebration of the Winter Solstice or Yule. I think the best place to start off, in this case, is with a little history. Most people know, to some extent or another, the history (biblical, objective, or some combination thereof) behind Christmas and Hanukkah, but I’d venture to say that Pagan history probably isn’t as widely acknowledged. Many Christian holidays have a lot in common with their Pagan predecessors, so chances are, you have seen variations on a lot of the elements we’ll be discussing, including a tale featuring a character similar to Jolly Ol’ Saint Nick (whose story is of Russian origin, and whose nickname, Santa Claus, is of Dutch origin) and decorating homes with evergreen plants (which has worldwide variants from the Norse to the ancient Egyptians). Just as I’ve mentioned that Christmas means something different to everybody, I’d also like to include the disclaimer that the history I include outside of the guest entries is what *I* understand Yule to be about. That’s based on my lone research on Wicca and various branches of Paganism over the years, which is probably pretty different from the perspective of someone who grew up in a Norse Pagan household, someone who’s a Celtic Pagan practitioner, or even someone who spends/spent time in a Wiccan coven. Though there are differences from branch to branch and community to community, Wicca is sort of the modern amalgamation of many Pagan cultures and traditions. So, with that all that in mind, get ready to string some garlands of cranberries and popcorn, because it’s time to get into the Yuletide spirit! 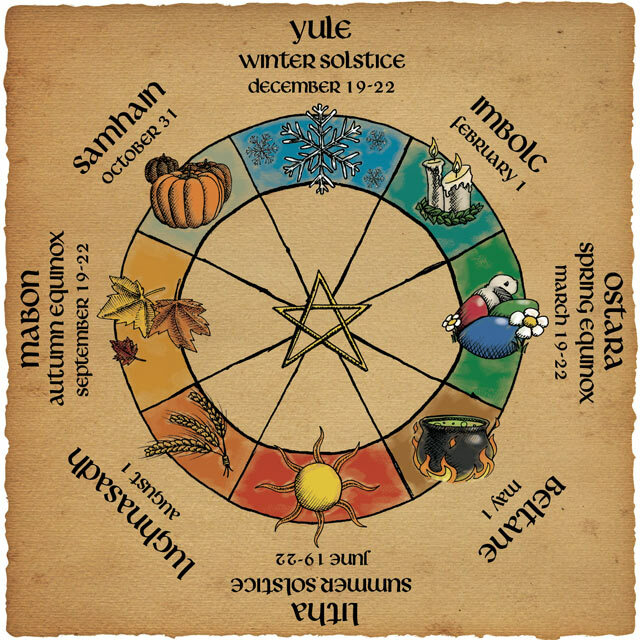 Yule is the Pagan celebration of the Winter Solstice, which falls around December 21st every year. Astronomically-speaking, it’s the shortest day of the year, at least from the perspective of someone living in the northern hemisphere. In Wicca, a system of belief where there “exists” a God and a Goddess that represent the opposites that make up the whole of all things and are the embodiment of the universe and the self through cycles of “death” and “rebirth” over the course of a celestial year, the Winter Solstice is celebrated as the rebirth of the God as he returns to bring warmth and fertility to the hearts of humankind. According to old Pagan customs, it was believed that lights and candles could be used to lure him out of his mother’s womb, so all lights would be left burning in a home or a candle or lantern would be left lit on the altar through the night of the solstice. The Yule tree is seen as a “wish tree,” where one’s wishes for the new year hang in the arms of the universe. The tree itself is a representation of the Goddess, as evergreens stay full and alive during the winter season, as the Goddess does according to lore. A part of the trunk is often saved for the Yule fire of the following year, tying the cycle of years together. Sometimes, a larger part of the trunk is saved for use as a maypole in the spring, which is a part of the sabbat of Beltane, a festival of rebirth. Customarily, the Yule tree is decorated with strings of cranberries and popcorn, cinnamon, and dried flowers. Even the wreath, which so many people across the world hang on their homes and hearths during the holidays, is a symbol from Pagan culture, representing the Wheel of the Year. Items placed on the wreath should represent the things one wishes to bring into fruition by the next Yule celebration. It basically functions as a physical collage of New Year’s resolutions. The similarities between Christmas and Yule are a result of Christian reinterpretation, which happened across many cultures as Christianity was spreading across the globe. The reinterpretation and incorporation of the traditions and practices of other cultures into Christian practices were an effort to make the relatively new religion more appealing to recent converts. It made the new religion feel more familiar and therefore made it easier to bring people from Pagan cultures into the religion. My name is Lori Ann Robinson. I’ve been an openly practicing Pagan/Witch for about 20 years now, though long before that, I was ‘in the broom closet’. I have an assortment of hobbies and interests ranging from collecting rocks and mineral specimens, to working on cars, all the way to hoarding classic, antique books. Once upon a time, I was a copy editor and reporter for a small weekly paper, but I quit that job about six years ago to pursue writing full-time, as well as to perform wedding ceremonies and freelance graphic design. I’ve authored four books and helped co-author another. I’m also a semi-frequent blogger (though I have a tendency to procrastinate). You can follow me at: http://loriannrobinson.blogspot.com/ and you can find my books here. I’ve been married for 22 years. My husband and I met on the first day of our fourth grade year, so it’s safe to say, we’re pretty much BFFL’s. We have an adult daughter who was married last year and who made us grandparents this past April. I have four coven sisters and four “spirit” nieces and nephews. We’re a close-knit bunch and spend an enormous amount of time together. Holidays around my house are a big deal, especially the Winter Solstice, which next to Beltane (May Day) is one of my favorite celebrations. This time of year means something different to everyone, but for me, it’s a cycle of patience — a time of waiting. I’m a warm weather bird, happy when everything is green and the sun is warm on my skin. Winter reminds me to be patient. It reminds me that though everything around me may seem cold, bleak, and lifeless, there is indeed life waiting just under the surface. It also reminds me that everything has to die in order for that new life to emerge. So, in our Solstice ritual we honor the return of the Divine Male who rules over darkness, death and rebirth. We allow the candles to burn down (the homemade tapers we use for spell and ritual work are made to burn a little faster than average store-bought). Once the candles are nearly spent, we place the log into the fire. Then one of us will do a reading of the Charge of the God. Sometimes, the following day, I’ll collect some of the ashes for use in other spell or ritual practice. We’re a little more eclectic than most groups in that we take turns as far as who leads in our rituals. At one time we had a rigidly structured coven (I was the High Priestess) but as my sisters grew in their experience and belief, it seemed only fair to me to share the lead. It’s worked well for us for several years. Once the ritual is complete, we’ll have dinner, which usually consists of Shepherd’s Pie and potato soup with homemade beer bread. For Shepherd’s Pie, mine is a little unconventional because my grandmother, who had 14 kids and lived off the land on a mountain in Pennsylvania, pretty much utilized whatever she had on hand. She taught my mother, who then taught me to do the same. As a result, I’ve played around with this recipe until I found one that everyone loved. It’s been a Yule staple in my home for about 15 years. Instead of ground lamb (which I love) or even ground beef, I use a lean beef or venison roast that I cook for about a solid 8-12 hours in a mix of Guinness or Irish Whiskey, which ever happens to be the most handy, though I’ve also used spiced rum with pretty good success. I chose a leaner, generally tougher cut of meat because you don’t want a lot of fatty pieces of meat going into this dish. The leaner meat when cooked properly gives it a more rustic flavor in my opinion, and, sometimes, you can get a pretty decent London broil for next to nothing. I also recognize that traditional Shepherd’s pie does not have a bottom pie crust, but when you’re trying to get a picky kid to eat and pot pie (which she identifies by the crust) is her favorite… You learn. You adapt. You overcome. So, yeah, pie crust — Don’t judge. I kept it this way long after it was necessary, because, now, the much younger kids prefer that crust, too. Either way you want to do it is fine, with or without the bottom crust. Without is more traditional. I’m not going to be looking over your shoulder. I pretty much cheat on all my pie crusts because it’s easier, to be honest. While I enjoy baking bread, I’m not much on making pie crusts. I’ll leave that to those who are not as lazy as I have been known to be. I cook for a crowd so at my house, I’m usually making two or three of these pies. No worries if you’re only doing one. You can freeze the additional filling and use it later or even add more stock to it and make vegetable beef soup. In a skillet, brown the roast on all sides in butter and then allow it to rest. In a crockpot or dutch oven, add the Guinness or whiskey, beef stock, minced garlic and other spices. Placing the meat and the drippings inside the pot, add water until the meat is half submerged. Slow cook until the meat begins to break apart. When it does, remove and completely shred it. Use the broth from the meat to boil the vegetables and barley in until most of the water is gone. Add the meat back and mix well. Press your roll out crust into a pie dish and ladle the meat mixture into it. For the topping, I do something a little different with my mashed potatoes, but any tried and true recipe works fine. Peel, boil, and drain the potatoes. In a mixing bowl, add potatoes, white cheddar, chicken broth, milk, butter, and garlic powder. Mix and mash until smooth. Using a rubber spatula, spread the potatoes over the pie and then sprinkle the potatoes with the dill. Bake the pie until the crust is almost done, pulling from the oven to add the sharp cheddar for the last 5 or 10 minutes until it’s melty. Serve and enjoy! Place cubed raw potatoes in a pot, adding the chicken broth, heavy whipping cream, butter and spices. Bring to a boil, then reduce heat to simmer. Add the cream cheese, whisking to get it combined. Simmer until potatoes are done. Depending on how many people you’re feeding, you’ll need adjust your batches. One batch will make approximately two bowls. I’ve used my oven safe soup bowls (which are large) as my mold, but I just recently bought actual Pyrex mini soufflé pans for this season’s bread. My life has always been about working with what I have, hence, we utilized the soup bowls in the past. Combine sifted flour with sugar, beer, and butter, mixing well. Pour into greased bowls or molds, dividing the mixture in half between the two vessels. Bake for about 1 hour (do the toothpick test). Allow to cool. Using a spoon, carve the center top layer out, scooping the bread out as you go until you’ve got a nice hollow cavity. Be careful not to go too deep or too close to the sides and break the crust. Ladle your soup into the bread bowl. I always reserve the bread I’ve removed for dipping. Like I said, one batch of this recipe made two bread bowls for us. I’m always feeding upwards of ten or more, so it gets to be a little chaotic sometimes when I’m making this for Yule, but it’s so worth it! It’s also awesome with broccoli and cheese soup and beef stew. Blessed be and Happy Solstice! Marni MacLeod is here to share with us her Finnish fare. Her blog, Our Family Recipes, features her holiday favorites. While I’ll grab her ingredients liststo get you started, please click the link embedded in the title of each recipe to get the full recipe on her site. Just for Apartment Eats, though, Marni was kind enough to write up a little story. 2 fresh salmon fillets, pin boned (I used wild sockeye) – 1lb each and the same size, skin should be left on. Don’t cheap out, get the good stuff. If you have lots of leftover gravlax, Marni suggests making this delicious salmon cream cheese spread. 2 cups pitted prunes (traditional) or apricots, chopped into small pieces and stewed with 1/2 to 1 cup of water and 1/2 cup of sugar or to taste (more for apricots) until consistency of filling for date squares, thick enough that it will stay in middle of square. Let cool (can be made day before).